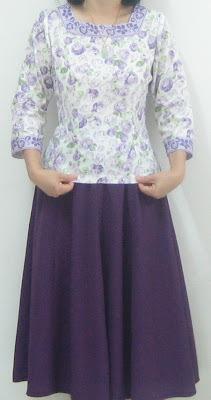 Finished this floral cotton blouse and dark purple flared skirt two days ago . Love this cotton fabric . Small purple roses on white background , fresh and charming. The strips used for the square neckline and the cuffs were cut out from the same fabric. Adding this little detail brings delightful look. Dark purple skirt is same pattern as the previous one . When at work, I am always rushing from one block to another ,this type of flared skirt allows me to go at a good pace. Some more fabric have been cut out and are in the progress of making. Just hope I can finish them before my holidays ends. I have some paper work to get done too, so cannot spend all my time on sewing. How is your Wednesday ? Hope you are happy and healthy . 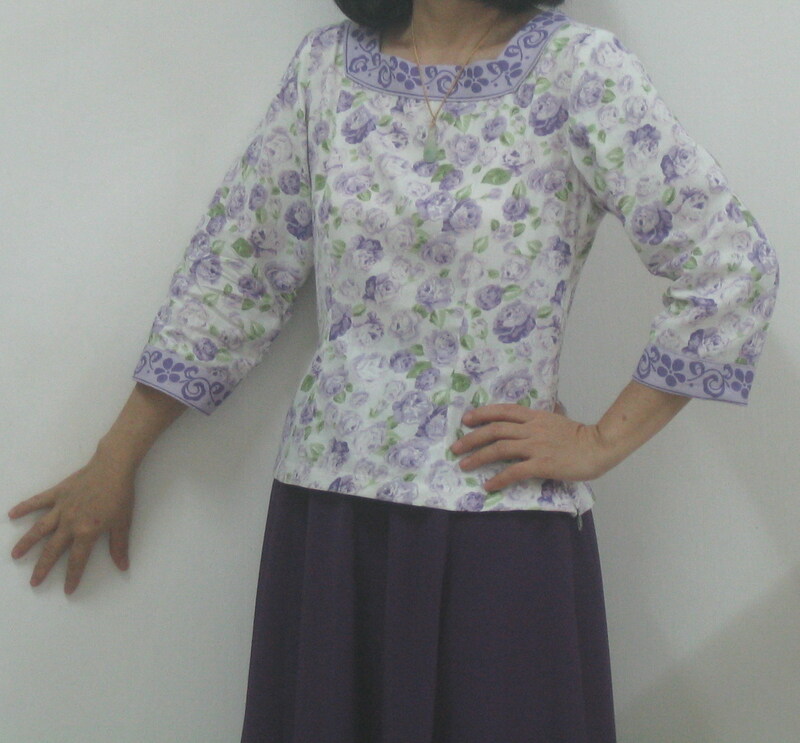 Hi, PY, I just checked out your beautiful floral blouse on flickr and I had to come visit your blog to leave some comments, because this blouse is simply gorgeous!! I love the floral fabric, and you did a wonderful job making it into a blouse. BTW I recently purchased a serger and I am ready to sew clothing! I'm hoping to find a little more time during summer to start sewing clothes (I need to first figure out how to use my serger), so meanwhile, I am looking at several Japanese pattern books to see which clothes shall I begin with... which is a fun process. You are my inspiration, PY! Amy,Thank you so much for your nice comments and encouragement always . I understand the pleasures while looking at beautiful pictures in pattern books. More fun if you can use them to help you to make some clothing for yourself and your family. Wow! A new serger ! You must be very excited with it! Serger is so useful for us who have passionately fond of sewing. I am looking forward to see your homesewn clothing! Have a nice day and enjoy sewing !